Be the first to share your favorite memory, photo or story of Randolph. This memorial page is dedicated for family, friends and future generations to celebrate the life of their loved one. 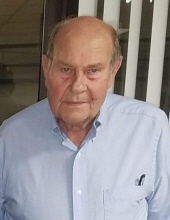 Randolph “Monk” Lassiter, 80, passed away on Thursday, January 24, 2019 at Wayne UNC Healthcare. Monk was born in Wayne County on October 11, 1938, one of ten children, to the late Nathan and Effie Mae Pearce Lassiter. He owned and operated Randolph Logging Company for many years before his retirement. Monk had a great love for NasCar Racing and also enjoyed the opportunity to make good wine as he was known by many for Monk’s Vineyard. He proudly served his community on the Oakland Fire Department. The family will receive friends on Sunday, January 27, 2019 from 4:00 – 5:00 p.m. at Seymour Funeral Home followed by a service to celebrate Monk’s life at 5:00 p.m. in the chapel with Rev. Kelly Buffalo officiating. The family will also greet friends immediately following the service at the funeral home. Interment will be Monday, January 28, 2019 at 11:00 a.m. at the Lassiter Family Cemetery on Lassiter Road, Princeton. Monk is survived by his wife, Shirley B. Lassiter; son, Jeffrey Lynn Lassiter and wife Debbie; daughter, Donna Gail Lassiter; grandchildren, Brandon Lee Lassiter and wife Sara and Christopher James Lane; brother, John Thomas Lassiter; sister, Marjorie L. Pipkin; and several nieces and nephews he loved very much including his special nephew, Larry Lassiter and wife Gloria. He is also survived by special friends, John and Faye Lane and his k-9 friend and companion, Fancy. To send flowers or a remembrance gift to the family of Randolph Lassiter, please visit our Tribute Store. "Email Address" would like to share the life celebration of Randolph Lassiter. Click on the "link" to go to share a favorite memory or leave a condolence message for the family.